Postcards from the Attic: A labour of love! Another UKS challenge today - this time to use hearts, red and song title with the word 'love' in it. I predictably scrapped the dog (he's better looking than the OH) and chose one of my fav songs for the title - I Love My Dog by Cat Stevens. The top part of the LO is created with Glimmer Mist and Glimmer Screens (oh how I love Glimmer Mist!). After spraying I traced around the shapes for definition using a fine liner pen. Some of the hearts are stamped and some are doodled. You can't quite tell in the picture but they are all layered at different heights using 3D foam. That took a while and patience I don't really have!!! I my mission to use up stash (New Year resolution) the stickers I used are totally ancient - like four or five years old I think. In my mission to stop stroking my papers and cut them up the papers here are my precious Basic Grey. I quite like but my goodness is it pink!!! 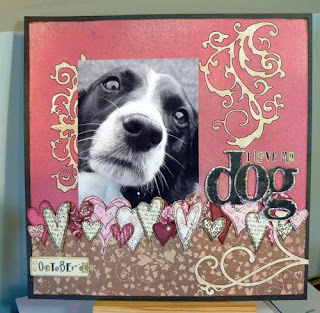 As the theme is love I am entering it for the Romance challenge at Gingersnap Creations too. Great layout and super cute pup! This is totally adorable!! thanks for joining us at gingersnap creations!